Veit Heinichen was born in 1957 in the extreme south West of Germany, near the border with France and Switzerland. He grew up in that corner of Europe where, between the Black Forest and Lake Constance, the Danube begins his course that will continue all over Eastern Europe. 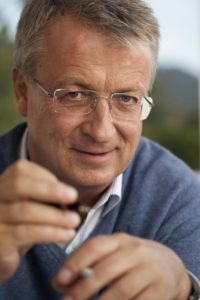 After his master degree in Economics at Stuttgart’s University and his work for the General Management of Daimler- Benz AG, he has a change of heart and starts working as bookseller and manager for different independent publishing houses all across Europe – such as Ammann Verlag in Zurich and S. Fischer Verlag in Frankfurt. In 1994 he decides to build his own independent career in the publishing industry and co-founds the Berlin Verlag, of which he has been director until 1999. He first meets Trieste, the city that will become his home, in 1980. It is here, in the city of wind, that his noir novels unfold, with Proteo Laurenti as main character. Commissario Laurenti comes from the South of Italy, Salerno, but lives in Trieste just like our author. The adventures of Proteo are bestsellers translated in nine languages (Italian, French, Spanish, Dutch, Slovenian, Greek, Polish, Czech and Norwegian). Moreover, five of his novels have become a tv series for the ARD, Germany’s national broadcasting channel. The novel Die Toten vom Karst (The Dead from the Karst) has been in the short-list of Franco Fedeli Prize for the Italian best crime novel of the year in 2003 and 2004. Die Ruhe des Stärkeren (The Calm of the Strongest) won the Azzeccagarbugli Prize for the best foreign novel in 2010 . On September 2005 Veit Heinichen obtained the Radio-Bremen-Krimipreis for his “constant and sensitive exploration of historical and political pattern, which has defined Trieste as favourite observation point of Central European culture”. In 2011 he gained the Premio internazionale Trieste Scrittura di Frontiera, in 2012 Noè’s Prize for his literary work. In 2012 he was among the finalists for the European Crime Fiction Star Award in Germany, together with Petros Markaris and Fred Vargas. Besides his work as a novelist, through his literature Veit Heinichen has spread the knowledge of the Alpe Adria’s Region among the European audience and in 2005 he wrote “Triest. Stadt der Winde” together with the famous chef Ami Scabar. This book is at the same time a journey novel and a guide of historical, cultural, food and wine patterns in Trieste, the city of the Alto Adriatico which is both the southern point of Central Europe and the northern one of the Mediterranean world.